The current challenge in landscape architecture is to integrate heterogeneous fields of action that are both, physical and philosophical, scientific and poetic integrating past present and future potentials into a single meaningful whole. Topology is a method of design with tools of modelling and visualisation combined capable of responding to a specific terrestrial situation, defining fields of action over time that can merge on the plinth of a larger territorial continuity. The conference is organized by the Chair of Landscape Architecture -Prof. Christophe Girot, Head of the Landscape Architecture Department of ETH Zurich and being supported. by the Volkswagenstiftung. The aim is looking for a critical debate about the contemporary intelligence of landscape at a time of relentless conceptual oscillation and uncertainty. Outstanding thinkers and practitioners will share their thoughts and convictions, to help shed light on a multitude of issues, on one of the most ill-defined concepts of our age – call it landscape if you will. Lectures and discussions will gravitate around the following three main topics: Science and Memory, Power and Terrain, Method and Design. 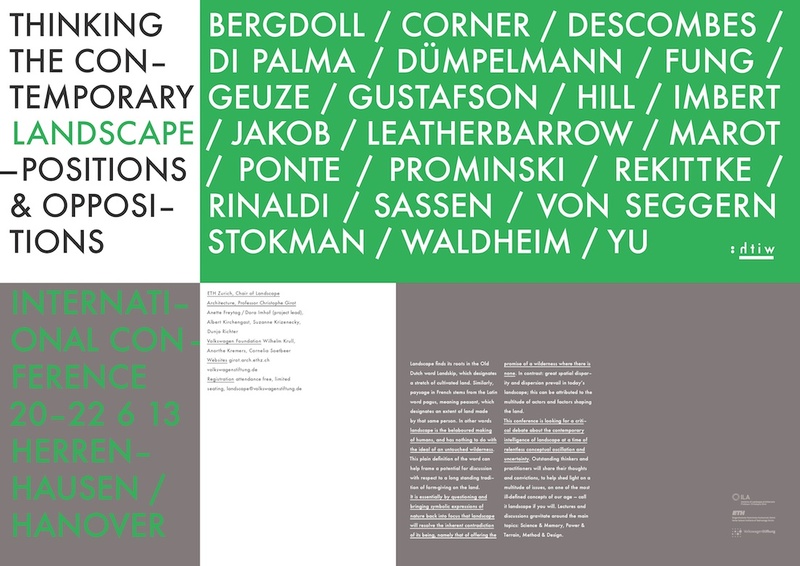 Further information can be found at the website of the Chair of Landscape Architeccture – ETH Zurich or the Volkswagenstiftung.